Screenwriters live a different life than most people, even actors and directors and crews aren't the same as us. For one reason that I often quote to aspiring writers and to anyone else who will listen is that we are the only ones in the film business that don't have to have a job in order to write. You might include producers but let's not. What I mean is this; we have the chance of getting hired by a producer to write a completely new screenplay or get hired to do rewrites on someone else's screenplay. But there's another shot at getting a movie made. 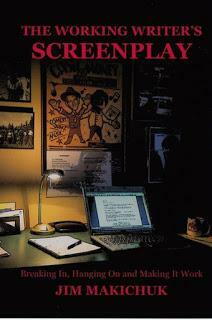 Yes, that book cover is my book on screenwriting. I didn't mention the back cover. Didn't want to put too much of me in it. Writers are the only ones who can write a "spec" screenplay (or script, same thing) on their own. Why write something without getting paid? Well, half of my original screenplays that were produced were spec scripts. In other words I wrote them by myself without getting a penny for them but then managed to sell them and get made. A dozen or so were bought but never made however. Yeah, that happens. Usually all you get is a small amount, since it didn't get made so you get anything from $500 to scale around $5000. I've got a stack of these specs that I wrote that number around 30 and I know very few other writers who have that many. There are probably more, but I don't know them. Why do I take that chance of writing a script that maybe nobody will want? For one thing I get to write it exactly how I want without a producer poking their nose into my story and telling me too change something on this page or that page. Of course when they buy it they will tell me to change stuff but at least that first draft is mine. And besides, what else should I be doing when I'm waiting for someone to buy another one of my scripts? One of my past agents said that he loved telling producers that "Jim is one of the few writers who likes to write." I'm not exactly sure that I like to write, but more like I have to write. The alternative is to sit and wait for the phone to ring or watch a lot of Netflix movies that someone else wrote. I do other things than write, however, I'm working on that doc you probably read a few months ago, the 90-year old pilot from WW11 in the Pacific campaign. My experience with cameras and editing also allows me to do shorts as well as around 40 youtube videos. Not to mention a few hundred commercials I wrote, produced and directed. And three movies I wrote and directed. In that sense, I'm more a filmmaker than a screenwriter. Probably all of you know about imdb.com, the British service that has become the equal of the NSA in that they know way too much about all of us writers and actors and directors. Over a period of ten years or so imdb has become the source to find out about anything in the film business. And that includes your age, which, if you're over 40 (some say 30) you stand a chance to lose a job. And one thing in particular that can praise you or kill you. And that is credits. Credits are gold. They can get you a job or lose it. For those few who don't know what credits are, it's simple; Your name on a movie or TV show and how new it is or how old it is. My example; my last credit was for The Town That Christmas Forgot. Now I am just at the end of my shot as a working writer unless I get a new credit. Fast. Credits are God, the more the better and the more recent the better. On this one, I discovered another name on my script. It was someone on the crew who wrote a few scenes. I called Writer's Guild and his name disappeared. And if you haven't had any in 3 or 4 years, everyone is going to think you're finished. Even if you have a few screenplays optioned as I have. And all they have to do is go to imdb and check on me. Imdb has made a few mistakes in my credits and I have attempted several times to have it corrected but they're like Google, they don't bother. Ever try to get an answer from them? So, what's left is the fact that we still can work, even if nobody's hired us. I converted my Emperor of Mars screenplay into a book and finished a book on screenwriting this year, while finishing a screenplay for an actor and director. But a lot of other people are; and that's the thousands of film crews who are losing jobs to tax credits given out by other states and Canada. But that's another blog. And that guy with white hair is my English buddy and he also writes and acts.